In an ideal world, all of my calculations and predictions are letter perfect. But, I do not have a support staff to proofread my work, and I write about upcoming events with in the next few days or week then post. During an earlier post, I had listed in a sentence or two that the Full Moon came up on Tuesday. The rest of the prediction was correct, and I apologize for any distress caused. In honor of the concept of “multiple oracles” and the fact that mistakes DO happen, I offer this link to Jim Shawvan’s site. What does it mean for you? To answer this accurately, we must know where Mercury stations in your chart. 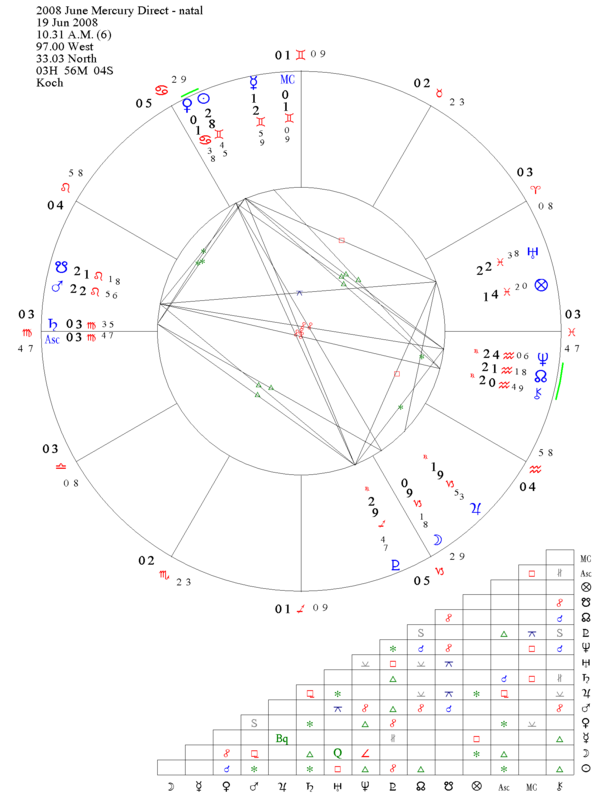 Note that the Moon (in Capricorn) will form an inconjunct with Mars in Leo. Uranus is also inconjunct Mars in Leo, and this forms what Steffie Azaria calls “The Finger of God.” That means a crucial decision must be made, and it has “explosive” potential. The Moon choice looks calmer than the Uranus choice, but then the Moon moves to conjoin Jupiter which always amplifies events. I truly hope nothing goes “boom” at this time. Where is the Mercury Direct Station in Your Chart? Although this chart shows the station to be at twelve degrees and fifty nine minutes of Gemini, we will use thirteen (13) degrees for the sake of convenience. In most years, Gemini starts “about” May 21st. This varies a bit not because GEMINI varies but because the CALENDAR has errors. That is why we have “Leap Years,” to remedy any “drift” in the calendar in relation to the sky (which is our “real” calendar). At May 21st, if we look thirteen (13) days later, we’ll find the date of June 2nd or 3rd (depending on whether or not you include the 21st in your counting). So, this will be our maker of the “Ascendant” (so to speak) for this event: June 2nd. So, first of all, find your birthday. If you are on a “cusp” here (say June 29th to July 2nd), then possibly either (or both) houses may apply. These predictions apply to a window open from June 19th through July 4th (approximately). The time of the New Moon, July 1st through July 3rd, will be a difficult time to launch events. The week prior to the New Moon will be a good time to “clean house” in preparation for a launch on or after July 4th. This is a period of at least a potential for a “fresh start” for you. The problems and mess of the past few weeks may be cleared away. If you chose to elope at this time, now you must start your marriage and household in earnest. Some of you are in your Solar 12th House, so you shouldn’t push TOO hard for progress, just enough to get the job done. If you are in THIS group of birthdays, but YOUR birthday falls AFTER June 19th, then you are in your Solar 12th House. After your birthday you can launch what you want to make to happen, and (again) this window is open until July 4th. A few of you will have a narrow “window,” so make certain to use this period to dream of what you want and make SOLID plans to achieve that. If you are NOT in your Solar 12th house, then this is a powerful time to launch things you want to accomplish, especially AFTER the New Moon on July 2nd. The 4th and 5th of July will be very strong for you if you are Gemini. The author discovered this process when another astrologer predicted that an unexpected check would arrive, probably in the mail. That is EXACTLY what happened; it is the kind of thing that doesn’t tend to be forgotten. The downside is that some of you will have to pay an unforgotten or unexpected debt. If so, then do it now if at all possible, else it WILL come back to visit you again, probably around September 25th or October 15th. The rest of you are likely to get a check, or some kind of payment, as I did. A few of you will start some kind of new health regimen, and this will tend to work well for you. Any form of “body sculpture” such as bodybuilding or weight-lifting will work particularly well when launched now. The first week PAST the New Moon of June 18th will be an excellent time to start a new exercise & diet regimen. The missing letter somehow arrives. The forgotten phone call is made. A misplaced (and crucial) file is found. Something lost is found here, and that lost something deals with communications, transportation, or accounting. Some of you will have to perform a necessary car repair, especially if you became aware of the problem in the past few weeks. Others will find the missing payment that caused your checking account to be out of balance. And, still others will find the missing letter. Dosmetic matters require your attention. This may be an important turning point for a child, yours or another close to you. You’ll want to clean up and re-organize now, especially prior to the New Moon. Pay bills and liquidate debt through the New Moon. This may be a good time to mount challenges against creditors. It is also a good time to find “sales” for items for your home. Lawn mowers could get cheap during this period. Expect a “deal” on household goods or services if you do the legwork. Watch the summer heat to prevent over-driving your heart. If you are an “extreme athlete,” then maybe you don’t need to be so extreme during this period. Each house rules a body part, and that body part becomes “identified” here as one possibly prone to problems. Yours is the heart. Be careful. That said, you are also the one group most likely to “win the lotto.” Unexpectedly, luck can come your way. Actually, it will tend to NOT involve money (the second house, above, has that) but maybe other things. Still, a few of you could be big winners. Frankly, a few of you SHOULD play the Lotto. Others of you can expect a new romance, the salvation of an existing romance, or some kind of breakthrough. Congrats! This is about being fair. You’ll need to balance all your affairs. If you have been cheated, be prepared to appeal to a higher source. Time to get out of any game where you aren’t getting a fair shake. Sometimes “bad guys” prosper here (oddly), but it doesn’t have to be that way. You may be tempted to not “stand up for yourself,” but this is one time where you should. And, if YOU are a “bad guy,” then you make get your “come upance” at this time. You did pay your taxes, didn’t you? If so, you are in good shape and may somehow get some unexpected refund. If not, be ready for that audit. Of course, YOU might be the “tax man.” If you are a police officer, however, don’t take bribes. Your secret may come to light now. Others of you will meet, or have to deal with, someone foreign who forces you to reconsider your position. College Professors or World Travelers will seem to appear from nowhere and espouse some doctrine that makes you jump out of that box you’ve lived in for so long. Zeus won’t let you sit still. And, a few of you will have some important event concerning an animal (likely a pet or livestock) come to pass. “My Friend Flicka” or “Old Yeller” might be up for a remake. Thinking about changing jobs? You may not be given a choice. Many of you will start the hunt for a new job or new career at this time. Others will find increased responsibilities as co-workers leave or quit. Expect more work, but like the Sixth House you should document everything with an eye toward either your performance review, updating your resume’, or both. Have you thought about becoming a “career counselor” yourself? If so, now is the time to make that move. A few of you will hear from old friends you haven’t heard from for years. High School or College reunions will be especially important for you. At this time, on the level of local, national, and global media, some event involving bribery may come to light. Others of you may be inspired to pursue a “social cause.” The casual meeting with an old friend could be VERY important, so don’t shuck it without a second thought. That person may represent a turning point for you. If you applied for a Government job some time this year, you may receive a notice that you are being considered and might be hired. Many of you know what this means. This is a dangerous time of “self-undoing.” The wrong slip of the lip, disclosure of that you don’t won’t disclosed, or excessive use of alcohol or drugs can make life miserable. For sure, it is a hard time. A few of you are poets, artists, photographers, videographers, or the like; those of you will experience a powerful breakthrough regarding your art. Like the Sixth House, and Tenth House, write it down and document EVERYTHING. If you are an artist, you’ll want to remember this period of your life. You might write “Thanatopsis” during a warm summer day in this short period. More about this weekend in another post. But, the key points about the energy of “this period,” through the 4th of July, are found in this post.